Check out our publications including reports, guides and resources for insights and best practices on selling at farmers’ markets, board governance, the economic and social benefits of BC farmers’ markets and more! This manual is packed to the brim with user-friendly tips, exercises, best practices, and templates that will help your farmers’ market board of directors no matter what stage of development you are at. 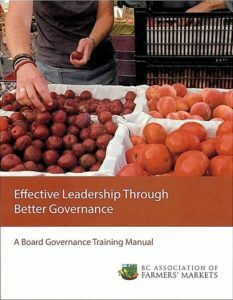 The Guide is tailored specifically for farmers’ markets, and will provide you with relevant guidance and resources for every twist and turn in your market’s journey to a successful, and healthy board of directors. The BC Association of Farmers’ Markets has developed a Guide to help local governments support farmers’ markets in their communities. 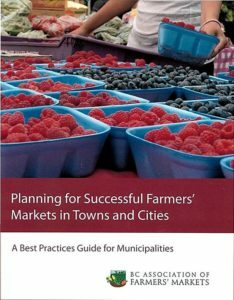 This Guide provides a how-to resource primarily for local governments to assist market organizers in achieving successful, productive farmers’ markets in their towns and cities.